​The map at left will orient you to the major sections of our pilgrimage. First we visit Jerusalem and the Judean countryside and then Galilee and the north. . Finally the Negev Desert region and Jordan. 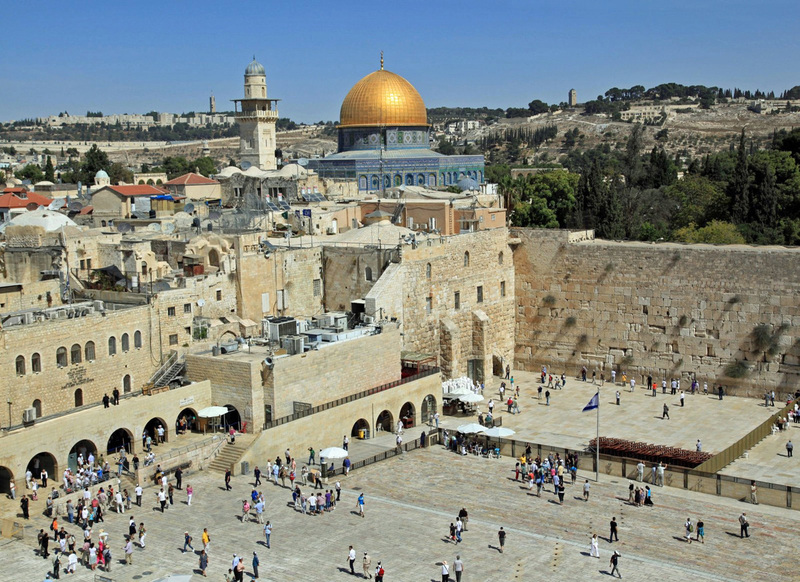 Jerusalem and Judea: Our pilgrimage begins with our arrival in the morning on May 1 at Ben Gurion Airport -- Israel's International Airport at Tel Aviv. 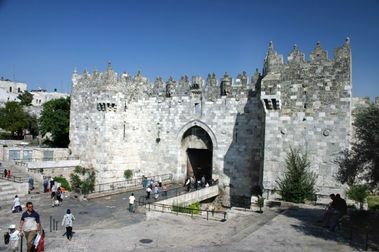 We travel any Air Conditioned motor coach to the Golden Walls Hotel, Jerusalem which will be our base for several days. From here we will make day trips that will take us to to Bethlehem, Jericho, the Dead Sea and of course we will explore Jerusalem itself. Galilee Region: Next we travel north up through the area once called Samaria to Tiberius where we will check into the Leonardo Club Hotel - a 4 Star facility that will be our Galilee base. From there we will make day trips to Nazareth, Capernaum, Caesarea Philippi, Cana, Mt. Tabor and many other sites in the north of Israel. On May 9 we check out of our Galilee hotel -- spend the day visiting the ancient cities of ACCO and Caesarea Maritima and then continue south to the Tantur Institute -- where we have dinner and check into our rooms. Tantur is -- a beautiful oasis in Jerusalem, overlooking Bethlehem. 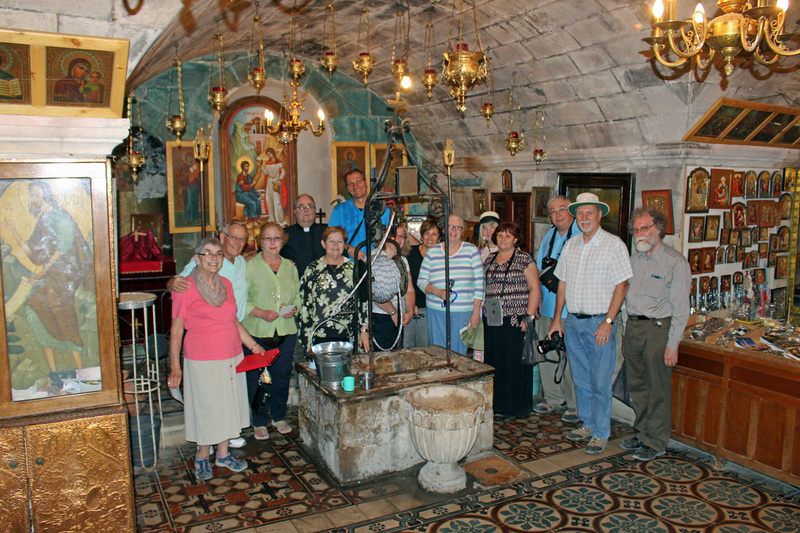 We spend May 10 on a Dual Narrative exploration day with two guides, and several visits including Bethlehem, and Hebron. On the morning of May 11 those returning to Canada will transfer to the airport for departure. The Jordan Extension begins on May 11 -- with a desert day travelling south through Beersheba, and into the Negev desert, across the Araba and then crossing the border into Jordan at Aqaba. We check into the Petra Old Village Resort Hotel for the two nights On May 12 we explore Petra for the full day. May 13 we visit Kerak, Madaba, and Mt. Nebo, staying overnight In Amman, Jordan at the Century Park Hotel. May 14 we cross back into Israel at the Allenby Bridge, and travel to Tel Aviv for our return flight to Canada. Right up to about a month before our departure, details of our pilgrimage itinerary are a work-in-progress. We are working with many people to try to fit various opportunities to meet and even worship with local believers. As these details are sorted, the schedule is adjusted. Scheduling in the Holy Land requires patiencejuggling a bit because Muslims, Jews, and Christians each have their own day of rest/worship - Friday, Saturday, and Sunday. A pilgrimage tour must be arranged with sabbath days and Holy Days of these three communities in mind. The outline that follows -- is largely what we actually did on our 2017 pilgrimage. In 2017 we went to Jerusalem first and then Galilee -- but in 2019 we are reversing this order because of hotel availability.) The itinerary descriptions that follow are intended to be informative and exemplary - but not precise. 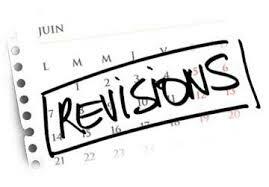 As the details of our schedule become clearer this page will be regularly updated. A few weeks before our departure we will publish a detailed itinerary. When we arrive in the Holy Land -- you will each receive a little binder with maps, contact information, and a finalized itinerary. Even after our tour is underway - changes sometimes are necessary. Sometimes we need to switch days around -- to accommodate local situations. Road Conditions, security, and the number of pilgrims visiting various sites are factors that are weighed up daily. Our local guides know where we plan to go each day. They also know when one site is very busy and another quiet -- it is sometimes best to switch things up. Being flexible results in the best pilgrimage experience for everyone. 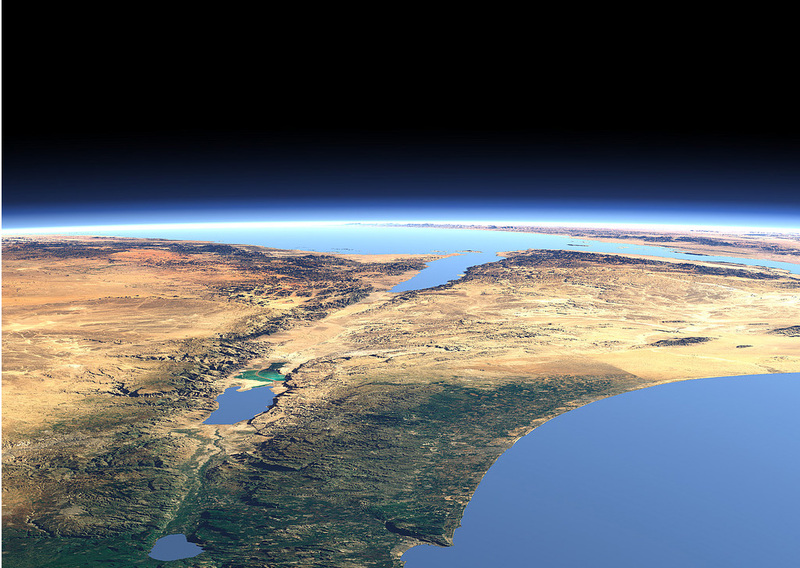 The Holy Land from space -- looking south. The Sea of Galilee is bottom left with the Jordan river flowing from it to the Dead Sea. The Mediterranean to the right. Depart the Canada (or the USA) en-route to Tel Aviv. Most of our group will travel together from Toronto to Tel Aviv. (Some may fly out of Boston or Winnipeg and meet us at Ben Gurion Airport in Tel Aviv. ) We suggest that you don't buy your tickets yet. The best ticket prices seem to be offered about 3 or 4 months before departure. Please wait a little while and we will coordinate ticket purchase so that we all arrive on the same flight or at least two or three flights at about the same time. Doing this facilitates easy transfer from Ben Gurion to Jerusalem. We arrive in the morning at Tel Aviv's Ben Gurion Airport, are met by Tantur Institute personnel. ​We plan a rather light day of touring given we are coming off a long flight. As we drive up the Mediterranean coast of Israel toward our hotel in Galilee, we will make a few stops at sites of interest. 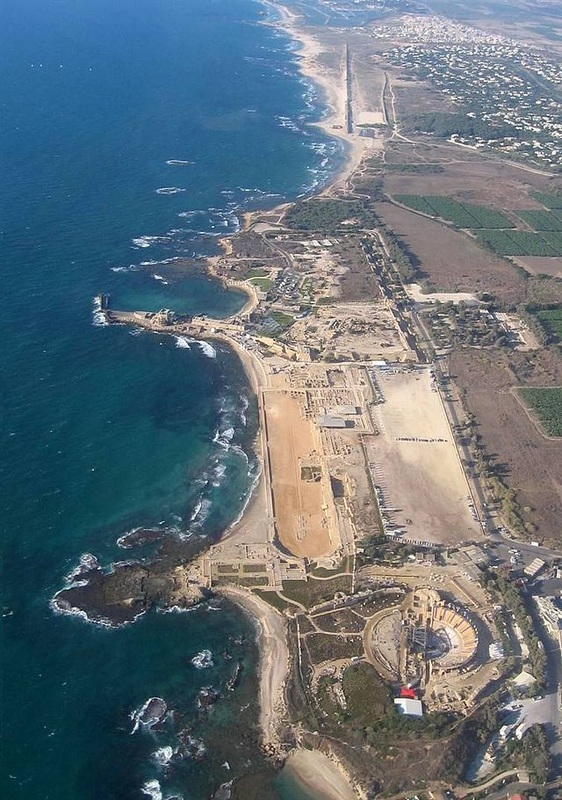 First stop will be the Roman capital of Caesarea Maritima. Here we visit the restored amphitheatre, aqueduct, and ruins of the city where Cornelius, a Roman Centurion became the first gentile Christian. It was here that the Apostle Paul was imprisoned for two years before being sent to Rome for trial. We lunch in Caesarea at Portcafe Restaurant, on the waterfront. Mt. Carmel. In the afternoon we visit the Biblical Site where Elijah demonstrated that YHWH was the real God and that the Baals were simply idols. 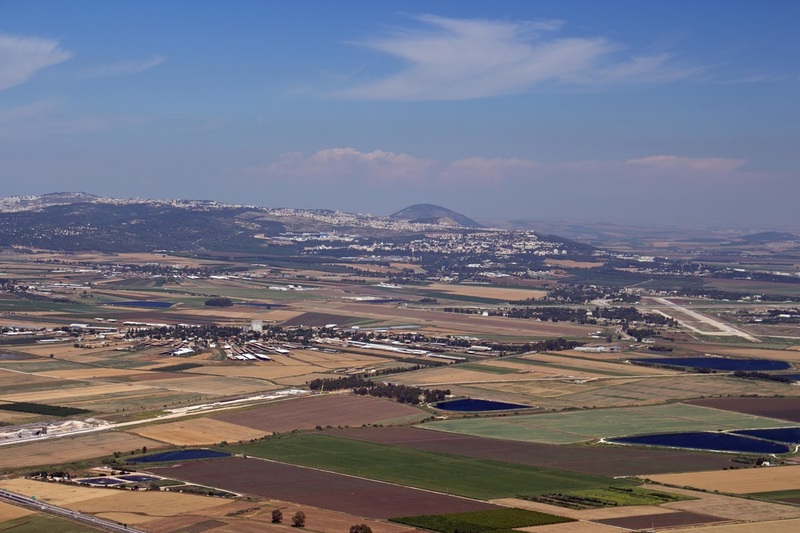 The view of the Jezreel Valley from Mt. Carmel is extraordinary -- and it will help you get your bearings. We then drive to Acco, once called Acre and the headquarters of the Order of the Knights Hospitaller of St. John. The Crusader fort and make Acco is a UNESCO World Heritage site. Our visit here will be brief but interesting. We then drive to Nazareth, the town in Galilee where Jesus grew up, and check into the Betharram Centre. After settling into our rooms, we will share dinner together. The guest-house offers excellent hospitality with good rooms with private bath, air conditionin & Internet. This will be our home for the next four nights. Our daily rhythm will be to have breakfast and supper meals at our hotel – with lunch at restaurants while out on our adventures. Middle-Eastern hospitality is legendary – and we have chosen our inns & restaurants carefully. View of the Plain of Sharon from Mount Tabor. Our third day in the Holy Land begins with a visit Cana, site of Jesus first miracle. We then drive to Mount Tabor, navigating its winding road by taxis to reach the beautiful Basilica of the Transfiguration with its magnificent views over the Plain of Armageddon. After lunch in Nazareth at the Holy Land Restaurant, we walk from Gabriel’s Church (Mary’s Well), via the Synagogue Church to the Basilica of the Annunciation. After Dinner we will have a visit from Fr. Nael Abu Rahmoun, Rector of Christ Church, Nazareth who will tell us a little about the Christians of the Holy Land. Our Sunday program begins with a short drive to the summit of the Mount of Olives for an awesome panoramic view of the walled city of Jerusalem. This viewing of the Old City really helps with orienting yourself to the geography. 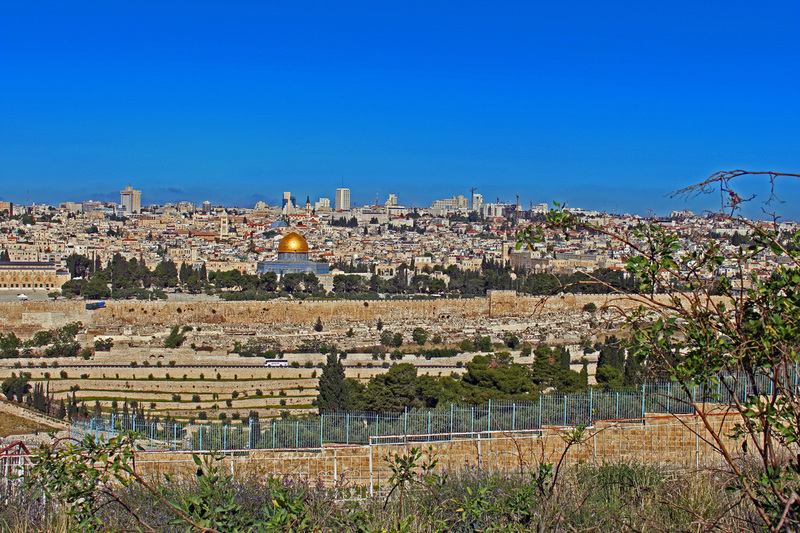 As we look across the Kidron Valley we see the Golden Gate, the Dome of the Rock and the Church of the Holy Sepulchre. With the Old City spread out before us, this is the perfect place to get the ‘big picture’ of the Old City. Then, starting on the summit of the Mount of Olives, we walk Jesus's Palm Sunday Route, pausing at the Pater Noster Church, Dominus Flevit Chapel (where Our Lord wept over Jerusalem), and the Church of All Nations in the Garden of Gethsemane. At 11 AM we join the congregation of St. George’s Anglican Cathedral for Holy Communion. After worship we enjoy for Lunch at St. George’s Guesthouse. This is the first of several opportunities for interaction with the “Living Stones” - the local Christian Church. 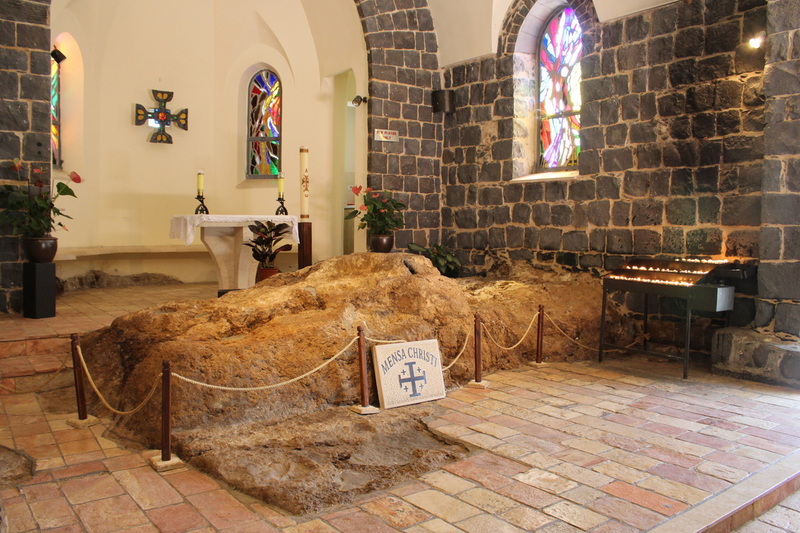 We then drive to West Jerusalem and the picturesque village of Ein Karem where we visit the Church of John the Baptist that marks his birthplace. We continue our orientation to Jerusalem visiting to the Israel Museum to view the large-scale model of ancient Jerusalem and to see the Dead Sea Scrolls in the Shrine of the Book. Our Sunday concludes with dinner and overnight at the Golden Walls. The Western Wall of the Temple Mount. We enter the Old City through Dung Gate and visit the Western Wall before ascending Haram esh-Sharif or Temple Mount to view the El Aqsa Mosque and the Dome of the Rock (entrance to the actual Mosque is not allowed). We then visit the Pool of Bethesda, the crusader Church of St Anne and the Lithostrotos (stone pavement where Jesus was condemned by Pilate) before continuing along the Via Dolorosa through the narrow streets of the Old City to the traditional site of Jesus crucifixion, burial and resurrection at The Church of the Holy Sepulchre. We will lunch in the Armenian Quarter at the Bulghourji Restaurant and then visit the richly ornamented Armenian Cathedral of St. James. We then walk through Zion Gate to Mount Zion and visit the Upper Room, Dormition Abbey, and the Church of St Peter in Gallicantu (traditional site of the house of Caiphus, The High Priest.) Our afternoon concludes with Holy Communion at the Garden Tomb. We return to the Golden Walls for dinner. After Dinner we will meet with the Rev. Canon Husam Naom, Dean of Jerusalem and pastor of St. George’s Cathedral. Canon Hussam will tell us a bit about the various Christian Communities that make up the Church in this land. He will help us to better understand the faith and the life circumstances of the Living Stones who are are our brothers and sisters in faith in this land. 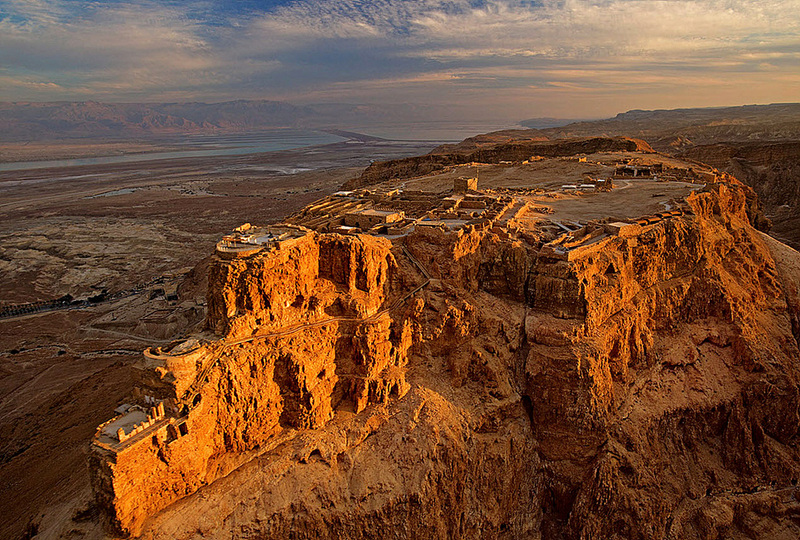 King Herod's mountaintop fortress of Masada. Today includes an excursion to the Dead Sea – the lowest point on earth at 1401 ft. below sea level. We drive into the Judean wilderness to Herod's desert fortress of Masada, which we ascend by cable car. Later we have an opportunity to float in the therapeutic waters of the Dead Sea. We then drive to the desert oasis of Jericho, and view the Mount of Temptation. After lunch in Jericho at the Al-Rawda Restaurant, we drive to Bethany Beyond the Jordan, Qasr el-Yahud where John the Baptist prepared the way for Jesus. Here at the Jordan River, those who wish may participate in a renewal of baptismal vows. The final part of our days journey is to Wadi Qelt, for a spectacular view of St George's desert monastery. On our return we stop at Bethany on the summit of the Mount of Olives, the village of Lazarus, Mary and Martha. We visit the Church and tomb of Lazarus. We return to the Golden Walls for dinner. Our 2015 Pilgrims at Jacob's Well. This morning we check-out of our Jerusalem Hotel. We then drive to Schechem, now Nablus and visit Jacob’s Well where Jesus met the Samaritan Woman. After visiting this site we will have a time to connect with some local Christians either at St. Luke’s Anglican Hospital (Nablus) or St. Phillip's Church (details still being sorted out.) Continuing north, we have lunch in Sebastia at the Samaria Restaurant, before visiting the Old Testament era Ruins of Sebastia. We then return to West Jerusalem to visit the moving Yad Vashem Memorial to the Holocaust. We drive to Bethlehem and check into the Manger Square Hotel where we will enjoy our Dinner. The Manger Square is only a couple blocks from the Church of the Nativity built over the grotto where Jesus was born. Over dinner and afterwards there will be opportunity to reflect on the things we have seen and done over the past days. Today we explore Bethlehem, Jesus birthplace. We begin with Manger Square and a visit the Basilica of the Nativity, Grotto of the Nativity and St Jerome's Caves. We will visit the Al-Shrouq School for the Blind in Beit Jala. (An amazing Christian Ministry in the Bethlehem area -- a chance for us to meet and understand the ministry of the local Church.) Then we will visit the Shepherds’ Fields where we will celebrate Holy Communion. After lunch in Beit Sahour at the Shepherds’ Valley Restaurant, we drive south into the Judean hills to visit Herod’s mountain palace/fortress of Herodion. We return to Bethlehem at days end and before dinner have time to shop in an olive wood shop. Dinner and overnight at the Manger Square Hotel. Today we visit the sites associated with Jesus' life and ministry around the Sea of Galilee. We drive from Tiberias a few miles to Tabgha (Seven Springs) and visit the Church of the Loaves and Fishes. We visit Mensa Christi (The Table of the Lord) where Jesus appeared to his disciples after his resurrection. There we will share in Holy Communion on the shore of the Sea of Galilee. We then visit the ruins of Capernaum – seeing the ancient synagogue and Peter’s home. We will lunch by the lake at St. Peter’s Restaurant. In the afternoon, we drive to Banias (Caesarea Philippi) and see one of the sources of the Jordan River. Returning through the Golan Heights, we finish the day with a sail on the Sea of Galilee, docking at our hotel for dinner and overnight. In the morning we share breakfast and check out of our rooms. ​For some in our party, this morning is their transfer to Ben Gurion Airport for the return journey home. Others will continue to on with our journey to the Hashemite Kingdom of Jordan. There we will visit the Lost City of Petra, see the Crusader Castle of Kerak, view the Land of Israel from Mount Nebo, visit Madaba and see it's famous byzantine mosaic Map. For information on the Jordan extension click here. 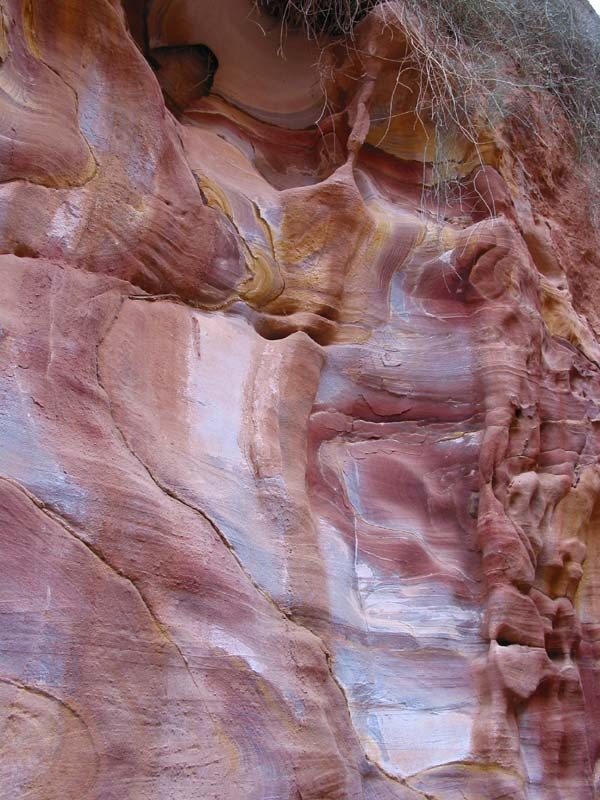 Petra: the Rose-Red City half as old as time. The Damascus Gate into the Old City. * If you are travelling alone, we may be able to introduce you to another person who is travelling alone in order that you might share a room and save the supplement. Reserve early and let us know your desires here and we will accommodate you if possible. Albina Tours personnel will meet your flight at Ben Gurion Airport, Tel Aviv, on arrival. Transfers to & from Ben Gurion Airport (Tel Aviv) on arrival and departure. Breakfast and Dinner every day at our Hotels. 8 Lunches at restaurants while on tour. Transfers and tours by Modern Air Conditioned Motor Coach with WiFi. English speaking qualified private guide on tour. Entrance fees to all sites. All tips to hotels, restaurants, drivers, and guides. Basically everything you need on this pilgrimage tour in included, the only exceptions as noted above. But we have quite deliberately not included airfare. Years ago groups got a substantial discount when you bought a block of tickets at the same time -- today most airlines seem to prefer to deal with people individually over the internet. Group discounts seem to have largely disappeared. Our experience is that we get very good prices on tickets buying tickets directly -- about 3-4 Months before departure. If we included Air Fare, we would need to build in some margin for error as ticket prices fluctuate daily. Since Trinity is arranging this pilgrimage on a break-even basis we really have no room for speculation on ticket prices. So, Airfare is separate. About 4 months before departure we start sorting out possible flights. We then contact all who have registered for the pilgrimage and work with them to get them booked on the best flights for their departure city. We do try to get everyone on the same trans-Atlantic flight or on a couple flights with similar arrival times to make the logistics easiest. 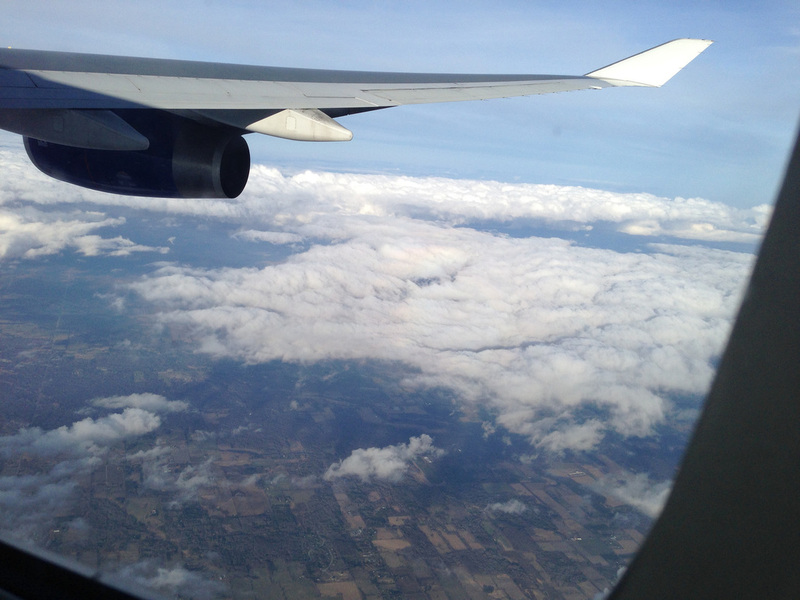 British Air and Air Canada were the best options on our 2015 pilgrimage. In the past, El Al and Al Italia have also been good choices. Once we have made our choice of preferred flights we will be in touch with all of those who are booked. Some of you are old hands at booking flights online and will just do it yourself. Others might like some help with that and if so we will gladly assist.